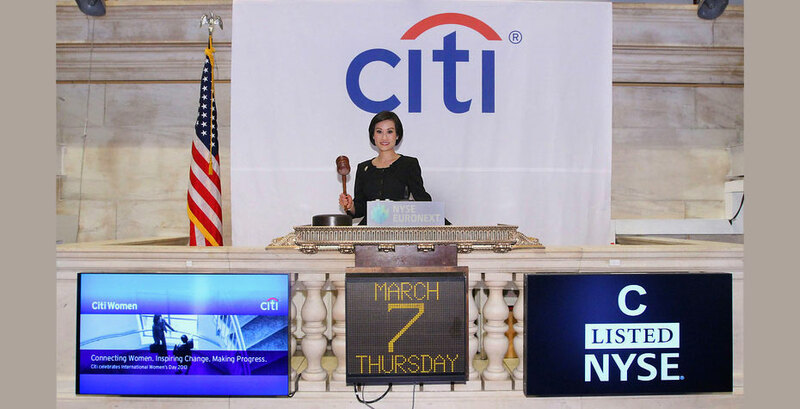 Ida Liu ’98, managing director at Citi Private Bank, and head of its North American Asian Clients Group, was among top women execs from Citi who rang the closing bell at the New York Stock Exchange on March 7 to commemorate International Women’s Day. In recognition of International Women’s Day, Citi and the Citi Foundation also announced support for two initiatives with a mission to advance the financial inclusion and economic empowerment of women around the world. At Wellesley, Liu was a double major in psychology and Chinese studies, with a concentration in economics. She has taken her career from finance to fashion and back to financial services again. It worked for Liu. After seven years in investment banking, she returned to fashion—first managing all the European collections for Bergdorf Goodman, and then as director of global sales, marketing, and business development for Vivienne Tan. After several years, she found herself missing the finance world, and so in 2007 she approached Citi with an idea to create a wealth management department for those at the top of the fashion, retail, and consumer sectors. In 2011 she was tapped to lead a new group at Citi Private Bank aimed at capturing “additional market share from one of the world's fastest growing ultra high net worth segments and expand the Private Bank's coverage and services to Asian ultra high net worth families,” according to a Citi press release. Liu credits her career mobility and success to habits of hard work and fluent Mandarin, learned at home, and to understanding the benefits of fresh perspectives on established topics and the immeasurable importance of a network, both hallmarks of Wellesley College.